"Scotch Bottom Horse Shoe Earrings"
Great gift ideas for the draft horse lover in your family. 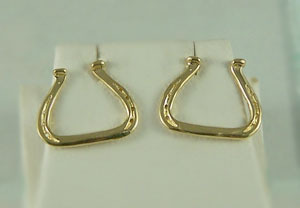 Scotch bottom horse shoe earrings. Attention draft horse lovers! Show off your love for this wonderful breed with the full cast design scotch bottom horse shoe earrings.